Jen Mirabile: It's Snowing Here!! Yesterday evening when Jared came home he said it was lightly snowing outside. I looked and it really wasn't much. It already has snowed once but just a few flurries and I was freaking out! Hey, I was born and raised in Florida, what do you expect? :) Well a few hours had gone by, Andon was in bed sleeping and Jared and I just finished watching a movie. I kept hearing people outside and had to know what the fuss was all about. I looked out the window and everything was pure white!! It was so bright outside that it looked like daylight! It was beautiful! I was running around the house so excited. We had to wake Andon up because he has been waiting to be able to make a snowball! :) So we all got dressed and headed out to play for a little. How fun is that!!! So glad you got your camera back. 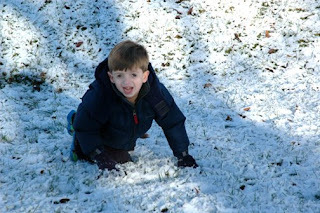 What cute pics of Andon playing in the snow. Did he complain about it being cold? 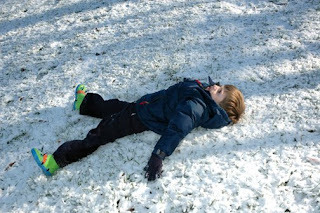 My grandkids all love the snow, but only for a few minutes before they're too cold and want to go back inside !!!! Oh well ... it's fun while it lasts! Looking forward to seeing you soon ... back in Florida (where we'll probably need the a.c. on for Christmas) !!!! Hey Terri!! No Andon didn't complain at all, I was the one complaining to go back in! :) My fingers were frozen! I know, I can't wait to see you too!! Oh , my kids want to see snow so badly. Waiting in a line in downtown winter garden just doesn't cut it!! So fun! ANdon looks like he is really enjoying himself! 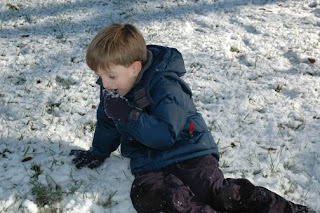 Growing up in New York we always had snow days - now our kids get hurricane days - I miss snow. So fun!!! I love that. . .wishe I were there! I'm so excited that you are coming soon! I would DEFINITELY love to plan a girls night out. . .or a few! PS Remember that I still don't have your number b/c of my phone being erased! Can you email me? That is the most fun! Wish we were there enjoying it with you. My kids so want to play in snow. Can't wait to see you. Love you. Wow, what I wouldn't do to live in a place that had snow again! Not a bunch of it, but occasional snow is fun. I remember playing out in it for hours. I have such fun memories of building snowforts, snowmen, snowmobiling and sking as a child. If you get a real good snowfall, you guys should try and find a place that rents snowmobiles, Andon would have a blast doing that. Hoping to see you when you come down for a visit!